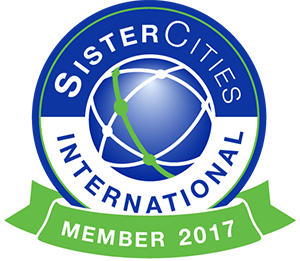 Sister Cities International was created in 1956 when President Dwight D. Eisenhower envisioned an organization that could be the hub of peace and prosperity by creating bonds between people from different cities around the world. Sebastopol’s Sister City organization began in 1985 when Sebastopol Mayor Tom Miller traveled to Yamauchi, Japan to meet with Mayor Shigehara Kusaba and sign the Sister City Cooperative Friendship Agreement. The following year Mayor Kusaba and his wife visited Sebastopol. An annual exchange between citizens has been ongoing ever since. In 1988 Sebastopol World Friends was commissioned by the City of Sebastopol to carry out the Sister City Program. The first delegation of middle school students to visit Sebastopol from Yamauchi came in 1988. The Sister School Charter between Brookhaven and Yamauchi Middle Schools was signed in 1991, establishing the long lasting program of exchange of middle school students between our two communities. In 1993 Mayor Lesch of Chyhyryn, Ukraine traveled to Sebastopol for the signing of a Sister City Agreement between the two cities. The following year a delegation of six Sebastopol adults visited Chyhyryn, paving the way for numerous delegations to travel to Chyhyryn for service projects and cultural exchange. Sebastopol World Friends has received grants to bring Ukrainian students here for High School and College study. In 2008 Sebastopol World Friends hosted a delegation of citizens from various parts of Ukraine as part of the Open World Program, a United States Congress program that sponsors young community leaders from Eurasia to visit communities in the US to learn first-hand about democracy and open governance. It was such a positive experience for both the participants and the hosts that in 2010 Sebastopol World Friends organized an Open World delegation from our sister city, Chyhyryn. Since that time we have hosted three more Open World delegations from Chyhyryn and plan to host again in 2016. A new Sister City Agreement with our sister in Japan was signed in 2011 after Yamauchi was merged into the City of Takeo. In 2011, The Japan Foundation Center for Global Partnership provided funding for an adult professional exchange for the 2011-2013 Leading Asia Program in order to promote sharing best practices, networking, capacity building, and innovative program development for US-Japan sister city partnerships, which was administered by Sister Cities International (SCI). With help from Takeo World Friends, eight representatives from Sebastopol visited various organizations and facilities to learn about their efforts and practices to promote sustainable development. The delegation also traveled to Tokyo where they met with Japan’s Minister of Foreign Affairs. In 2012, in response to our community’s interest in sustainable development, SWF hosted a delegation of five college students from Kagoshima University in Kagoshima Prefecture on Kyushu Island, Japan, studying sustainability with specificity in Fair Trade. The year 2015 marked the 30th anniversary of the City of Sebastopol’s relationship with Takeo/Yamauchi, Japan. 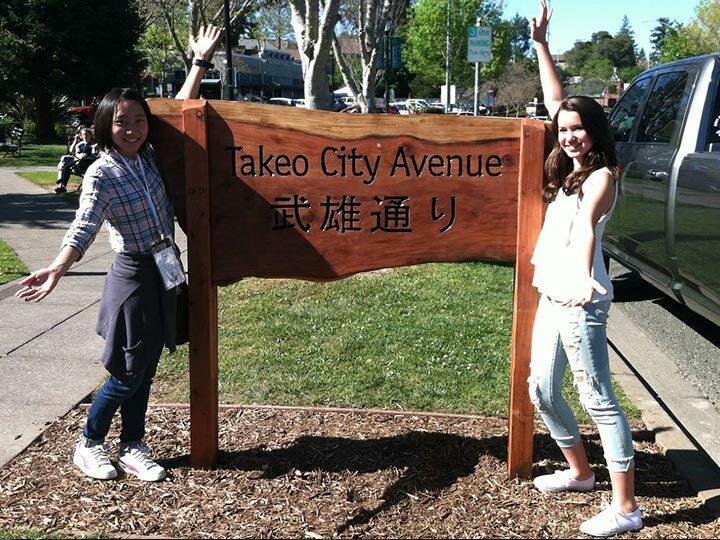 The community celebrated this special milestone by welcoming an extended delegation of students and adults from Takeo, ceremonially renaming a portion of a downtown city street “Takeo City Avenue,” and marching in the Annual Sebastopol Apple Blossom Parade.